Healthy gums. Strong teeth. Fresh breath. 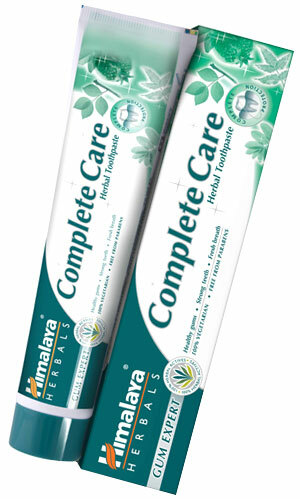 Himalaya Herbals Complete Care Herbal Toothpaste is a 100% vegetarian, paraben free herbal toothpaste. Miswak and Babool help prevent gum inflammation and help reduce gum bleeding. Neem, an effective natural antibacterial, fights germs. Pomegranate is an effective natural astringent. Contains Calcium Fluoride (500 parts per million). Brush thoroughly with Himalaya Herbals Complete Care Herbal Toothpaste, at least twice a day, or as directed by a dentist or physician. Children six years and below should have adult supervision and use only a pea-sized amount. Do not swallow. Spit and rinse thoroughly after brushing.